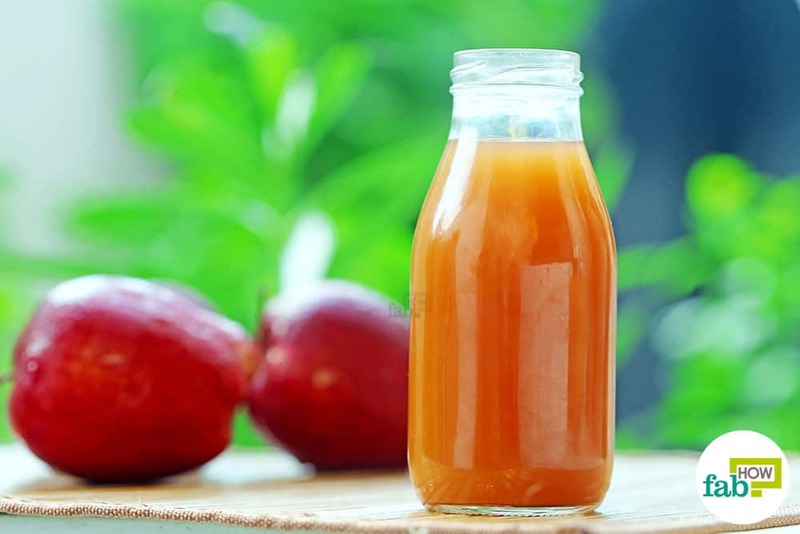 Raw, unfiltered apple cider vinegar can easily be called an elixir for health. It can be used to naturally treat, control and manage a wide variety of diseases and conditions. From treating long-term medical conditions like diabetes, hypothyroidism and uterine fibroids to digestive issues like acid reflux, indigestion and even stomach ulcers, apple cider vinegar acts as a panacea for all ills. Furthermore, it helps cure yeast infections and skin conditions like hyperpigmentation, rosacea and melasma, to name a few. Additionally, you can use apple cider vinegar to get gorgeous hair and skin, especially to get rid of acne. While apple cider vinegar is readily available in the market, it is always better to make your own raw apple cider vinegar because of two main reasons. First and foremost, you cannot be sure of the purity of the commercial products, and secondly, organic, raw and unfiltered apple cider vinegar is very expensive and will cost you in the long run. When you make it at home, you are assured of the purity of the product and do not have to shell out cash to enjoy a long and healthy life. Below are two tried-and-true ways to make homemade raw apple cider vinegar. You can try them both and see which one works best for you. The second method does not use any sugar and is a healthier option, especially for diabetics. Before you start making your homemade raw apple cider vinegar, it’s extremely important to ensure that all the containers used in the process – whether for fermentation or straining – are sanitized and free from any bacteria. If the jar contains any bacteria other than what is in the vinegar, it will likely develop mold and will not be fit for consumption. To sanitize your containers, bring water to a boil in a pan and then turn off the heat. Immerse the containers in the water for at least 5 minutes. For proper sanitization,the bottles must be completely immersed and not floating on top. Here, we show you how to make homemade raw apple cider vinegar using apples along with sugar and water. Once you have done all the prep work, it is merely a matter of doing the right thing at the right time and letting the natural process of fermentation proceed unhindered. In this method, we used sugar to kick-start the fermentation, as it acts as a catalyst to start the process of transforming the raw ingredients into vinegar. However, if you feel that sugar is not a very good option for you, you can substitute it with raw honey, preferably organic. Just keep in mind that if you use honey, the fermentation process will take longer and the resulting apple cider vinegar will not be as strong. Dip and clean the 6 apples individually in a bowl of water to make sure that the skin is completely clean. Chop the apples into roughly medium-sized pieces, leaving the skin on. 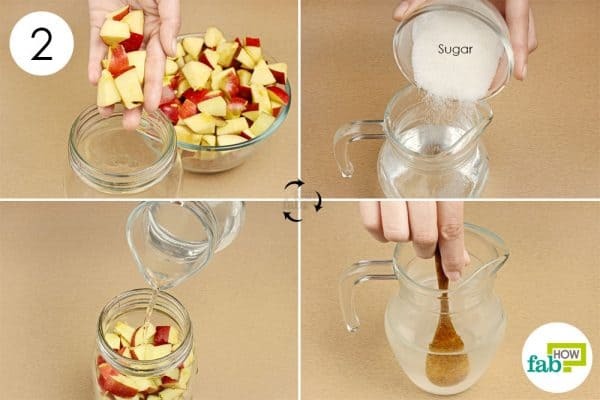 Place the chopped apples in a large Mason jar. Make the sugar solution by mixing ¼ cup of white, granulated sugar into 2 cups of water. Stir it until the sugar is completely dissolved. Pour the sugar solution into the jar. Ensure that the apple pieces are completely covered by the sugar solution. Fresh fruit will float upward in water. When making apple cider vinegar, you have to ensure that the apple pieces stay below the water level to prevent them from going bad. 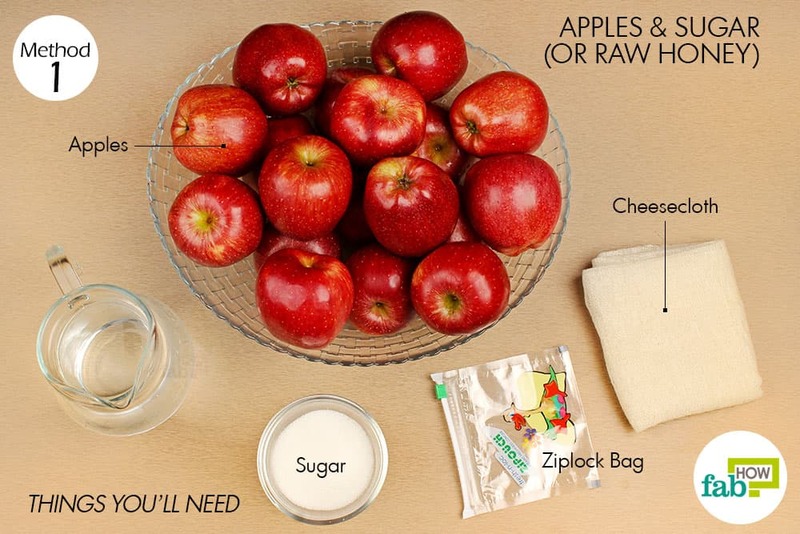 Simply fill a ziplock bag with just enough water to weigh down the apples and seal it shut. Next, fold and insert it carefully inside the jar. Be gentle so that the bag doesn’t spill or burst. Place a folded piece of cheesecloth over the mouth of the jar. Use a rubber band or piece of twine to secure it in place. The cheesecloth will allow all the elements to breathe and ferment without developing mold. Store the jar in a cool, dry and dark place for fermentation. Check it after 2 to 3 days. You will notice that bubbles have started to form inside, which means the fermentation process has begun. Leave the jar in storage and let the natural fermentation proceed unhindered for at least 17 days. Then, just check up on it to ensure that things are progressing as desired. Mark your calendar and check it again after 14 days and after 28 days to keep track of the fermentation process. As long as the apple pieces are floating upward in the solution, the fermentation process is not complete. Eleven days after the last check and roughly 70 days since the fermentation process began, remove the jar from the storage place. You will notice that the apple pieces have sunk to the bottom, which indicates that the fermentation process is complete. Remove the cheesecloth. You will notice some fizzing or bubbles, which means it’s time to strain out the vinegar. 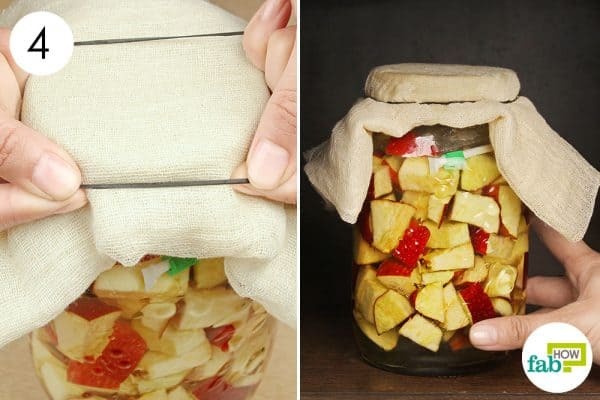 Use a pair of cooking tongs to remove the ziplock bag from the top of the jar. 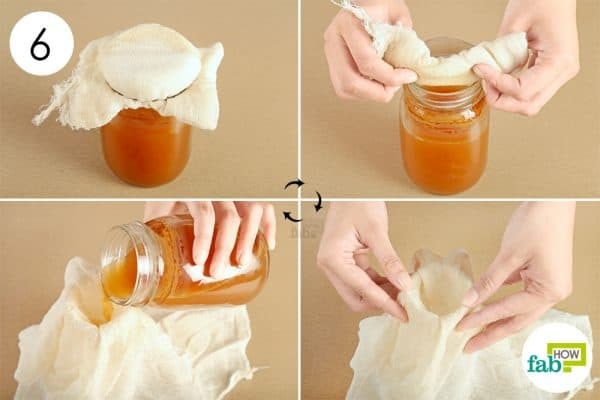 Secure the cheesecloth over another Mason jar using the same rubber band. Mold it around the jar’s mouth and neck to create a strainer. Slowly pour out the fermented liquid into the makeshift cheesecloth strainer. The cheesecloth will let the vinegar seep through, while the solid compost material remains behind. You now need to let the vinegar ferment on its own for a while. Just cover it with a clean piece of folded cheesecloth and secure it in place using a rubber band. Store the jar in a cool, dark and dry place. Leave the jar in storage for another 60 days. Right now it has the composition of alcohol, you need to let it ferment further for it to convert into vinegar. After 60 days have passed, remove the cheesecloth cover and taste the vinegar to see whether it has the desired tartness and consistency. 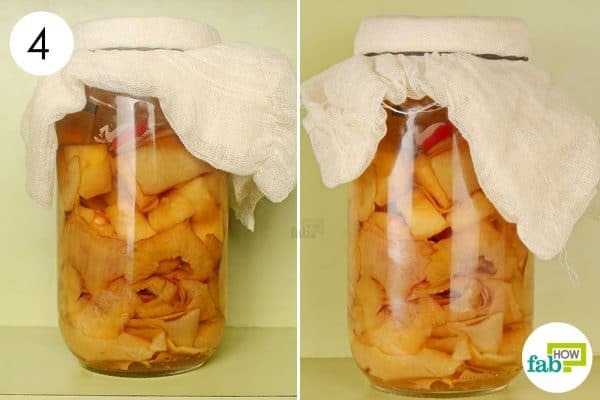 If you feel that the vinegar is not yet ready, you can let it ferment for a few more days. Once your apple cider vinegar is ready, strain it into a glass pitcher in the same manner as described in the step above. Transfer the vinegar to a corked glass bottle and put in the cork. Now, what are you waiting for? 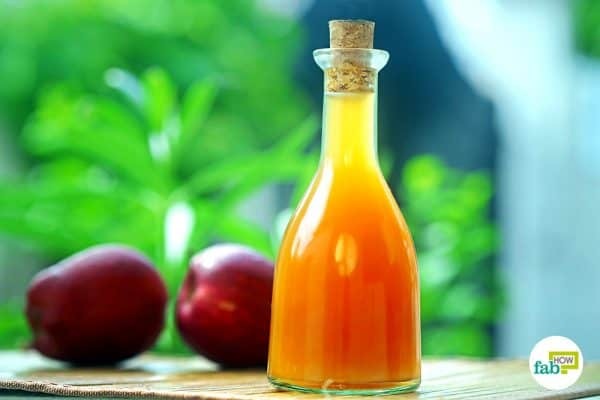 Mix 1 tablespoon of your homemade raw apple cider vinegar in a glass of warm water and drink it daily in the morning to enjoy good health and improve your metabolism and digestion. If you are drinking apple cider vinegar for the first time, you can start by mixing 1 teaspoon in a glass of water daily for 1 week, slowly increase it to 2 teaspoons and finally work your way up to 1 tablespoon. 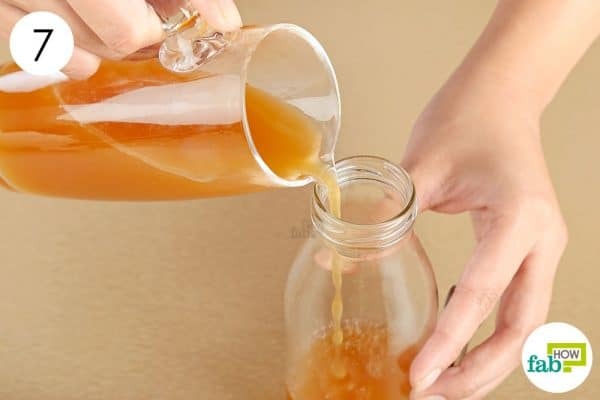 In this method, we show you how to make homemade raw apple cider vinegar using apple peels, chopped apples and ready-made raw, unfiltered apple cider vinegar. This recipe does not contain sugar and is a healthier option, especially for diabetics. Another reason to use organic, raw, unfiltered apple cider vinegar is that it speeds up the fermentation process in comparison to sugar. Some people even use the raw, unfiltered “mother” to further hasten fermentation. 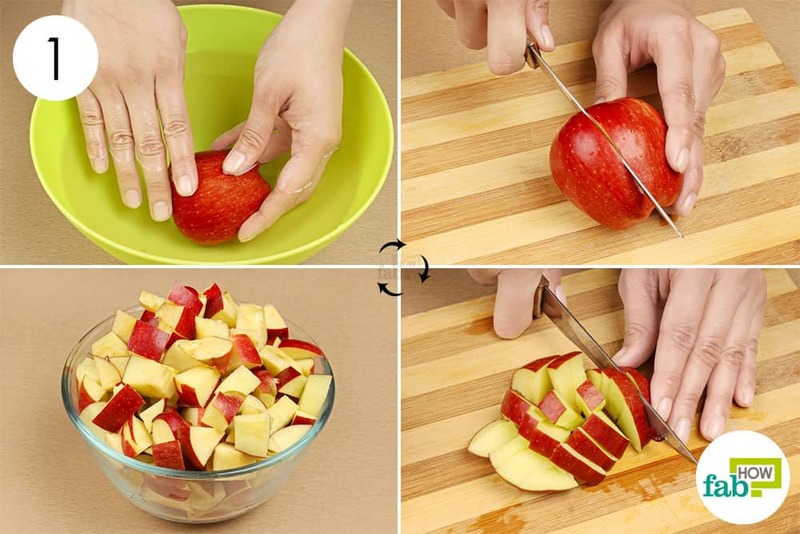 Clean and carefully peel 6 large apples. Chop up the peeled fruit as well. Carefully place the apple peels inside a large Mason jar. Add the chopped fruit as well. Pour water into the jar, leaving just 1 inch of apples at the top uncovered. 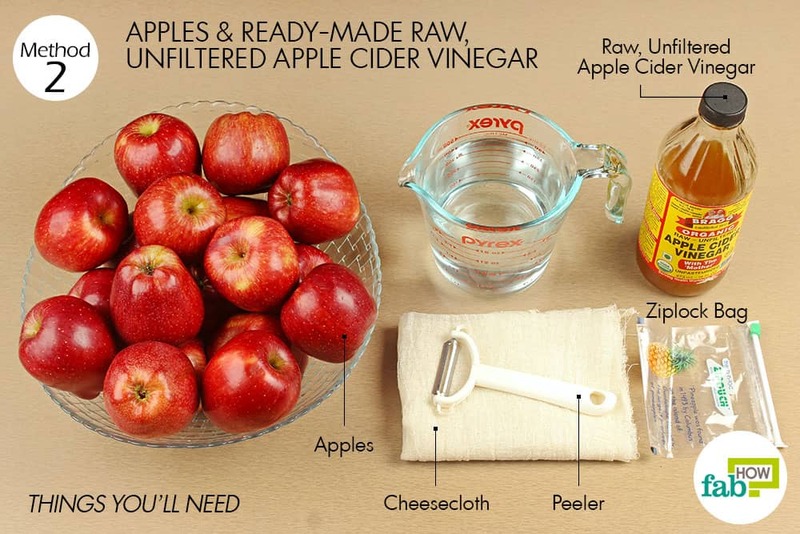 Add ¼ cup of raw, unfiltered apple cider vinegar to boost the fermentation process. Fill up a zip-lock bag with just enough water to keep the apples down in the liquid and seal it. 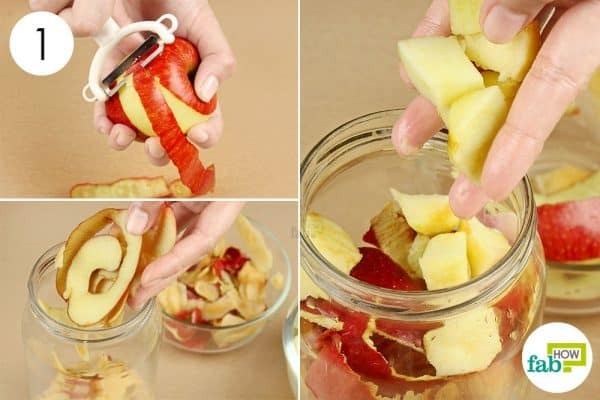 Fold and carefully insert it inside the jar on top of the apples to keep them below the water level. 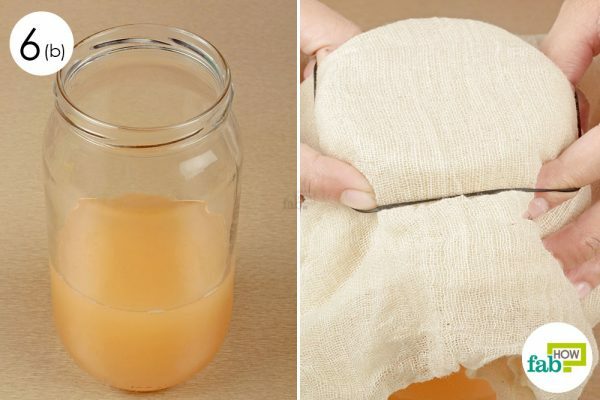 Place a folded cheesecloth over the mouth of the jar and use a rubber band to secure it in place. Place the jar in a cold, dark and dry place and let the fermentation process take its course. Check the jar after 2 to 3 days. You will see tiny bubbles throughout the jar, which indicates that the fermentation process has begun. Check on it at regular intervals to keep track of the fermentation process and to check for any growth of mold. Check it after 17 days and again after another 14 days to ensure that the fermentation is proceeding smoothly. Approximately 28 days after the last check and 2 months from the date the fermentation process began, remove the jar from its storage place. Next, remove the cheesecloth lid. Using a pair of kitchen tongs, remove the water-filled ziplock bag from the jar. 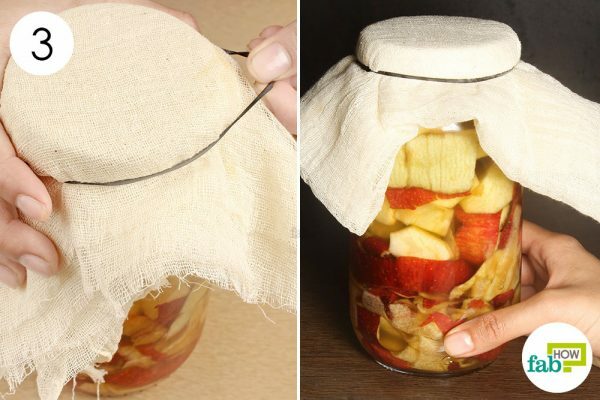 Strain the fermented vinegar into another Mason jar using a folded piece of cheesecloth to separate the liquid from the solid compost. 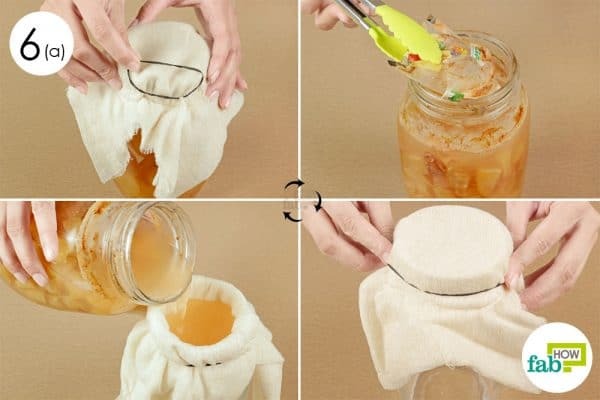 Cover the jar with the strained liquid using a clean piece of cheesecloth and a rubber band. Store it in a cool, dry and dark place to continue fermenting. Let the vinegar ferment for another 45 days. 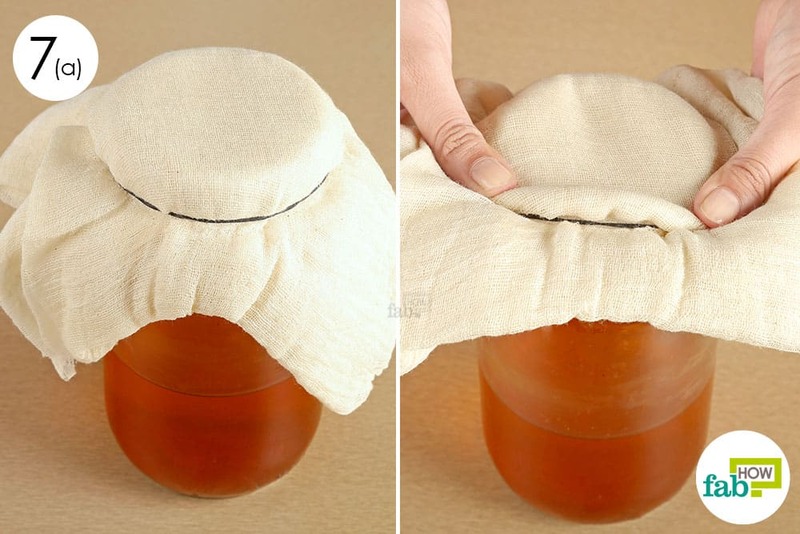 Remove the cheesecloth lid and check to see whether the vinegar has the desired acidity and consistency. If not, you can leave it to ferment for a little bit longer. 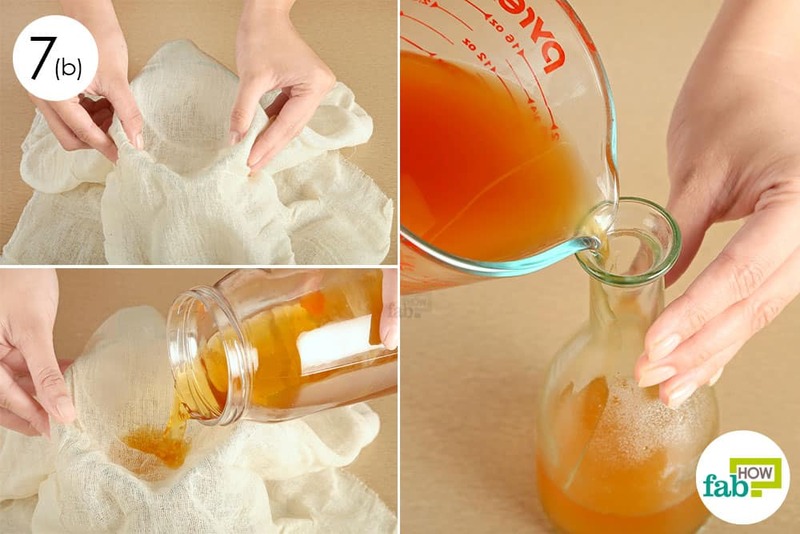 Once your vinegar is ready, strain it into a pitcher using another clean piece of cheesecloth. 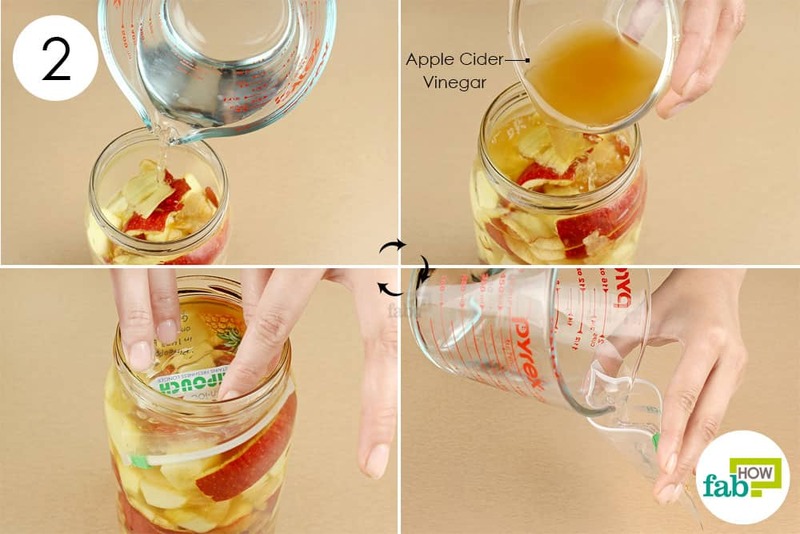 Transfer your homemade raw apple cider vinegar into an airtight bottle and put on the lid. Consume 1 tablespoon daily to enjoy good health and keep digestive problems like irritable bowel syndrome along with gas and bloating at bay. 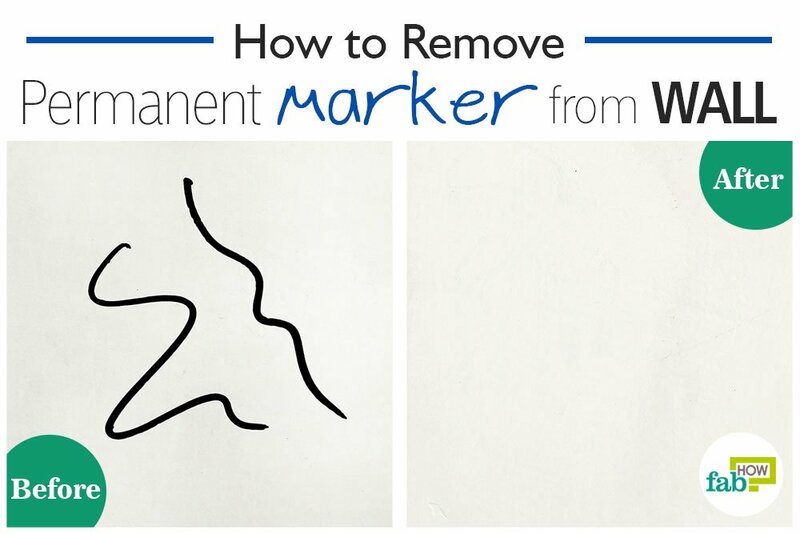 If you notice white foam on the surface, do not worry. It is the ‘mother’ containing live bacteria formed as a result of the fermentation process. It gives apple cider vinegar most of its beneficial properties. However, if the foam is of any other color like blue, black or green, it means that the vinegar is not fit for consumption and should be discarded. For best results, make sure that you wash the apples thoroughly to remove all dirt and impurities along with any pesticide residue. In fact, it would be best if you could get pesticide-free apples from an organic store. Another factor to keep in mind while making homemade raw apple cider vinegar is to ensure that all the apples you use are of the same variety. Thank you for your comment klsrinivasan. Stay tuned for more DIY & useful tips. Formation of bubbles or fizz as you say means fermentation process is still continuing in your homemade apple cider vinegar. The fermentation process depends on season – less during summer, bit longer during colder months. Can you tell us how long have you kept it for fermentation and which method was used by you among the given two? Also, do not bottle the vinegar if it’s fizzing, cover it with a cheesecloth or paper towel as fermentation releases carbon dioxide, and ethanol. You may also get an airlock as it allows the fermentation produced CO2 to expel the oxygen in the container, which protects the cider. 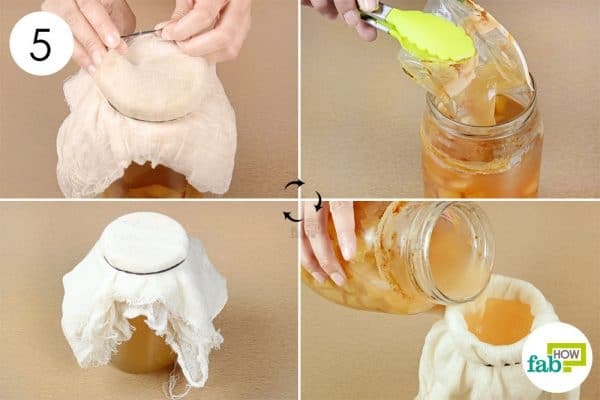 Try to minimize the surface area (make sure it is as full as possible without spilling) and keep the fermentation at a lower temperature, so it doesn’t ferment violently (less leakage). Thank You so much Dear FabHow Team …. You are right this is the best recipe i have ever seen before. I have prepared the Apple Cider Vinegar but last it is very successful and very useful to us. Thank you so much for your response. We are so glad that we were able to help you. HI, THANKS FOR SHARING…. CAN I USE BROWN SUGAR INSTEAD OF WHITE SUGAR OR HONEY ? HOW LONG CAN WE KEEP OUR OWN DIY APPLE CIDER VINEGAR? You can use brown sugar but not honey. We suggest you use white sugar for better results though. 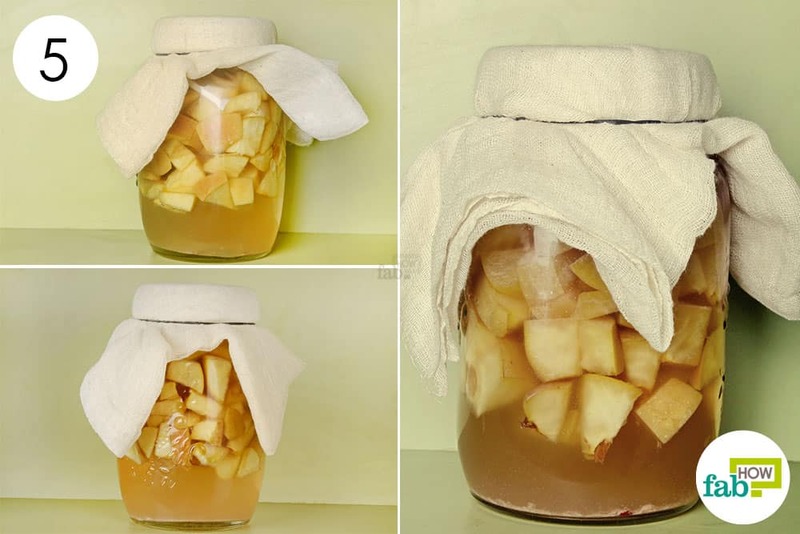 This homemade ACV will keep good up to 8-9 months. Just keep it in a cool dry place. I just had a quick question, I have read in most online recipes that you need to stir the mixture every three days during the apple submersion period and after you strain it but in your recipe there is no stirring required? I know you mention just keeping an eye on it for mold? I am a little confused stirring is necessary or not? I would appreciate some help? Thank you. I just wanted to know is stirring the mixture every few days a requirement other online recipes emphasize it’s importance. It is not necessary to stir the mixture every 3-4 days. 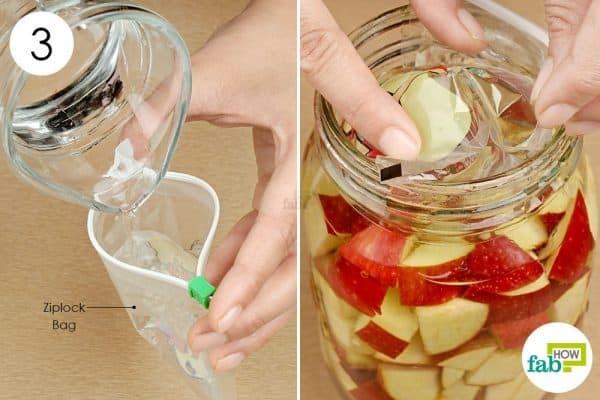 Just make sure the apples and peels are properly submerged in water. In case they are not, they you need to give it a stir. I just had a question about the apples being used in ACV. I read online recipes that if you are using organic apples, you can use the all of it like skin, cores and seeds. I found out that Apple seeds contains small amounts of cyanide in them, so is it okay to use it? Or there could be adverse effects? I currently used seeds in my ACV? Should I be concerned or is it okay? Thank you for your query. It is better to deseed the apples before making your ACV, but if you have used it there is nothing to worry about. What if the apples don’t fully sink to the bottom after 70 days, can you still strain the apples and move on to the second fermentation or you have to continue to wait until the apples completely sink to the bottom before you move on. It may take more than 70 days for fermentation depending on the weather conditions and temperature where you live. Once the apples start to settle down, it is the sign of fermentation to be complete. We suggest you monitor it daily and give it another month for the process to complete.